Kalashnikov Concern is presenting its new unmanned aerial vehicles and landing boats at the Integrated Safety & Security Exhibition (ISSE-2015) in Moscow, announcing that it is has begun investing in dual capability and paramilitary products. “As part of the 2020 development strategy, Kalashnikov Concern is expanding its abilities to become a system integrator of duel-purpose solutions for the convenience of potential customers,” Aleksey Krivoruchko, the CEO of Kalashnikov Concern, said in a statement. The ISSE-2015 expo is the first event where the company is demonstrating “a comprehensive approach to unmanned aerial vehicles and modern landing boats,” Krivoruchko added. In February of this year, Kalashnikov Concern bought controlling shares (51 percent) in ZALA Aero Group, an air drone maker; and Rybinsk Shipyard, a shipbuilding company. Kalashnikov plans to invest 700-800 million rubles ($US 14-16 mn) into the two enterprises and expects to recover the investment within three years’ time. ZALA Aero produces a number of winged and copter drones that can be equipped with a variety of cameras and sensors of the client’s choice. 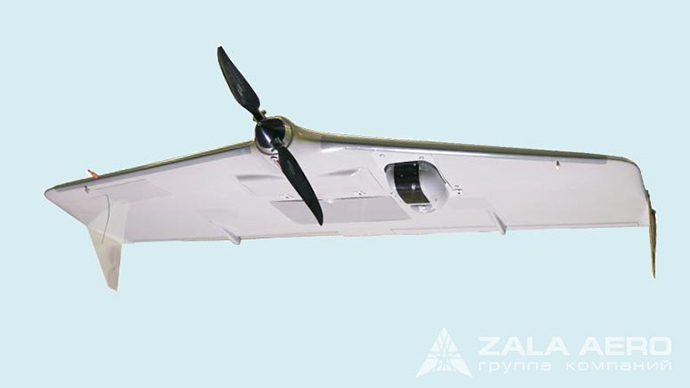 The company’s ZALA 421-08M small class (up to four kilograms) drone has an automatic target-tracking module, a unique feature for a drone of its class and size. Another of the company’s drones, the ZALA 421-22 copter, is capable not only of conducting video surveillance, but of guarding a set perimeter or monitoring a designated infrastructure installation. It can carry a specially designed sea rescue package, the SSK-4, consisting of an inflatable life jacket or small inflatable raft, and deliver it with high accuracy to the specified coordinates of an emergency area. ZALA Aero Group makes drones for a number of Russian companies including Rosneft, Gazprom, Lukoil, and Rosatom; and Russian security agencies such as the Ministry of Interior and Emergency Ministry. The Rybinsk Shipyard Company has brought two boats to Moscow to be displayed for Russia’s security agencies and Emergency Ministry. One of these is the Leader 12M, an all-purpose cutter for both civilian and military use, that can be used for patrol missions, rescue and fire-fighting operations, and diving work. The second is a landing boat, the BK-10, which can be used for close-to-shore maneuvers, personnel transportation, assault landings, medical evacuation, and counter piracy and anti-terrorism operations. Russia’s largest security expo is being held at Moscow’s VDNH exhibition complex from May 19 to May 22. The ISSE-2015 has attracted 386 participant companies from seven countries.